This Two Stacks review was made after playing the game six times. We were sent a copy of this game by the publisher in exchange for an honest review. 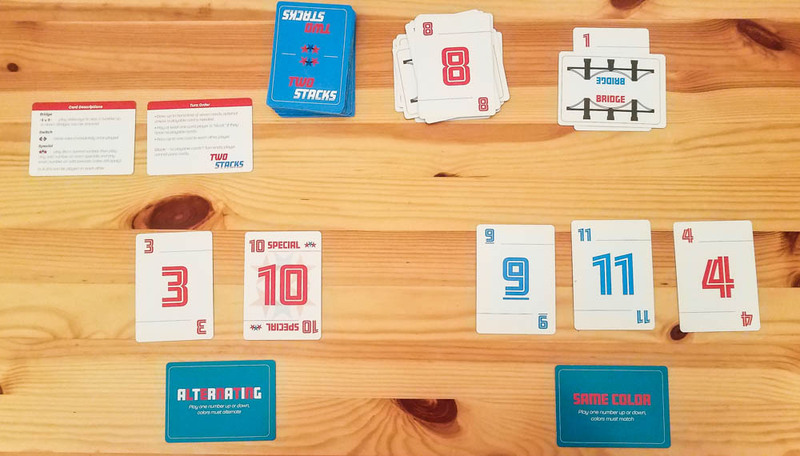 Two Stacks is a cooperative card game from Edward Doreau in which players are trying to work together to get rid of all of the cards in their hands. In Two Stacks, everyone has a hand of cards and over the course of the game you’re trying to play all of your cards to the two stacks on the table. The cards are numbered 1-12 and there are two red versions and two blue versions of each number. The cards on top of the two stacks let you know which cards need to be played next. Every card you play will have to be one above or below the number on one of the stacks. For example, if you want to play onto a 10, you’ll need to play either a 9 or an 11. Every player has a role card in front of them that changes how they can play on their turns. There’s a role that forces you to match the color of your cards to the cards on the stacks (red to red, blue to blue), a role that makes you alternate colors, and roles that make you always play higher or lower numbers. There are also some cards in the deck that change the rules in different ways. There are Special cards that allow you to play any odd card on an even Special or any even card on an odd Special. Players switch roles whenever a Switch card is played, potentially making it easier to play more cards on a turn. Bridge cards allow you to skip numbers, so, for example, you could play a Bridge on a 10 and then play an 8 or a 12. The more Bridges you add to the deck at the beginning of the game, the easier it will be. On your turn you’ll first draw as many cards as you want to up to your seven-card hand limit; you don’t have to draw if you have a playable card. You’ll then play as many cards as you can to the two stacks. Finally, you can pass one card from your hand to any other player. If you can’t play any cards on your turn, you’re “stuck” and you can’t pass a card. You’ll beat two Stacks if everyone is able to get rid of all of their cards. You’ll lose if every player is stuck. The roles in Two Stacks make the puzzle a bit more interesting than I was expecting. They can also potentially set up some satisfying combos when you play the Switch cards. The Special cards also add to the strategy in this game. Since these cards allow you to choose what you play next, you need to think about who the cards benefit most before you make your decision. I like that it’s really easy to increase or decrease the difficulty by simply adding or subtracting Bridge cards. All of our games took about 15 minutes, including setup, so Two Stacks works really well as a filler or after dinner game. The rules are simple enough for anyone to understand, including younger kids. 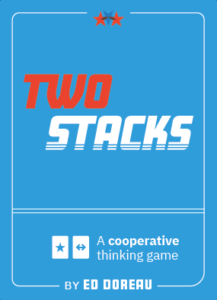 Two Stacks might be the most portable cooperative game that you can get right now. It’s just a deck of cards that comes in a small tuck box that can fit in your pocket. Two Stacks has a very high luck factor. Everyone can play their cards perfectly and you could still end up losing if you draw poorly. Quarterbacking can definitely be an issue in this game. Unless you’re using the “Secret Mode” variant, everyone’s hands are face-up on the table, so it can be tempting to tell others what to do on their turns if you see the optimum plays. We tweaked the rules a bit to avoid this by having everyone hold their cards and only allowing table-talk when players were passing cards at the end of their turns. Since the roles are a really cool part of the game, I wish there were more of them. In the two-player game you’re forced to always use the Same Color and Alternating roles, which is a shame. Two Stacks ended up being too light for my group. Once we made those house rules I mentioned above, it had a similar feel to limited communication games we enjoy like The Game and Cahoots, but it still didn’t have quite enough meat on the bones for us. I don’t consider Two Stacks to be a gateway game as it’s too light to get most people into modern board games, but it definitely does have a market. If you’re looking for that next step up from classic card games that you can play with your family or you want to get a cooperative game that you can play with non-gamers, Two Stacks could be a great choice. It could also work as a co-op game for kids since the rules are so easy to understand. Thanks for taking the time to read our Two Stacks review! To stay updated on all things cooperative board games, follow us on Twitter, Facebook, or via RSS.